In response to requests from the Marlow Society and the Marlow Town Council, Red Kite agreed that the picture of Nesta Liston, which has been in New Court House since its gift to the town, should be installed in Liston Hall. New Court, a house that was gifted to the town, transferred to the Wycombe District Council and then sold by the WDC to Red Kite has now been sold to Lennox Estates. This company was kind enough to allow us to open New Court for Heritage Open Day in September 2017. The inscription underneath the portrait reads: " Mrs Nesta Forbes Liston, 1890-1970 of New Court Marlow, Chairman of the Marlow Urban District Council in 1936, A devoted Benefactress who gave the Liston Hall and this house, her home, to the Town ". 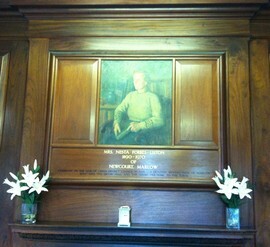 We welcome the retention of the portrait as a reminder of Nesta Liston's generosity.